Back in 06/07 I was obsessed with coffee and managed to get some pretty good results out of a Silvia combined with a Mazzer Super Jolly and a bread maker/heat gun combo for home roasting. Then unfortunately life got in the way of living and since then the wife and I have been surviving off pod coffee, mostly for the convenience. I've recently been bitten by the coffee bug again and want to get back into it. Unfortunately though the Silvia has since been stolen and I'm now in the market for a couple of new espresso machines and a new grinder. The plan is to keep the Mazzer for home and combine that with a good espresso machine but first up I'm after an espresso machine and a grinder for my workshop. When I'm at the workshop I usually have three to five espressos a day and my wife and some friends who come over on a fairly regular basis also prefer espressos to milk based coffee. So I'm after a machine that will consistently produce a great espresso, I'm only interested in something brand new and I would prefer something that doesn't scream 'fancy coffee machine' as every customer who comes into the workshop will see it and after having the Silvia stolen I'd prefer to get something that doesn't look overly expensive/flash. Then I'd also like to get a grinder that is consistent enough to produce a great coffee but preferably something that doesn't look as big/expensive as the Super Jolly. Again because of the Silvia being stolen. The budget that I have for the espresso machine and grinder is about $750ish but I don't mind spending a little bit more based on your recommendations. So far I have looked at some of the Breville machines and don't mind what I'm seeing (specially with the PIDs) but since I've been out of the coffee scene for so long I would love the better educated thoughts of the CS community. I so hear you about the coffee bug! A machine that appeals to me is the Lelit PL042EMI. 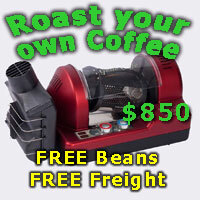 It is a combi machine that could well slot into your workshop, and with a small increase, your budget. Good luck on this exciting next round of your coffee journey. Thank you for your response GreenBeanGenii and for your suggestion of the Lelit. I looked it up on Talk Coffee and was impressed with the description but was a little surprised not to see a reference to PID. Then I saw the Lelit PLO42TEMD down the bottom of the page and followed that link. Thanks again mate, I really appreciate your help. Whilst your thoughts on a PID are irrelevant in a HX machine, in a small single boiler machine, a PID will make things easier and would be helpful if your budget can extend that far. PIDs on HX machines aren't unheard of. But am I right in saying this is often more about the ability to precisely 'fine tune' (if you're feeling really fussy) details rather than a need to achieve greater temp stability? I've just noticed the advertising on this page (for me anyway). No not the scary skinny clothes model - she's got my (bloke's) figure with a different head. I mean the Behmor Brazen - if budget's tight and you don't want anything that screams expensive anyway... and you don't value milk based anyway... you want a Behmor Brazen! It's more forgiving on the grinder front than a 'machine' as well - your $750 'cap' for machine and grinder is in no danger at all. 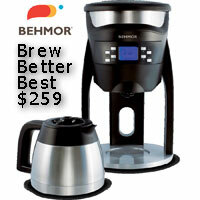 Buy the Behmor from this site and get a kilo of beans while you're at it. 1) The easiest one and the hardest one at the same time - increase your budget. 2) Either a Gaggia Classic or Rancillio Silvia with a decent small conical burr grinder. You'll have to hunt around, but for example you can currently get a brand new Gaggia Classic from Segafredo here in NZ for about $550, and you can get a Breville Smart Grinder Pro from Harvey Norman for $200. Boom, there's your $750 and a pretty decent package. 3) A Sunbeam of some sort. You're probably more likely to pick up a Sunbeam in that price bracket than a Breville Dual Boiler. Eg. Smiths City in NZ had the EM7000 recently for $550 (or something like that). I think it's Harvey Norman over here currently have a Sunbeam package for about $700 - the EM6910 (probably the best one of all the Sunbeams) and the EM0440 grinder. None of these options are particularly flashy and they all do a good job. They'll all take a bit of practice, but if you had some success with a Silvia in the past then you should be able to get up to speed with one of these. Thanks for the responses everyone, I really appreciate the time and thought you have all put in to help me out. I've really been struggling to decide what would type of machine would best suit an environment that gets fairly dusty at times and will be located in an area that is clearly visible from both the front door and the roller door to the workshop. I would love a high end Italian designed machine and I could use the Mazzer but maybe I should look at that set-up for home and get something more basic/generic for the workshop. That way if the dust gets to it or it gets damaged or pinched maybe I won't take it as badly as I have with losing the Silvia. All of your suggestions are being researched and they are certainly helping me to decide which way could be the best direction to head in. Thank you all again for your help. Just thought I'd post an update on the coffee machine and grinder solution for my workshop. After reading through everyone's suggestions and having had a chat with Chris from Coffee Talk, I decided on a Breville Dual Boiler and Smart Grinder Pro for the workshops coffee solution. The Dual Boiler looks fairly ordinary sitting on the bench and no one has given it a second look so far. So I'm chalking that up as a success. Since its a Breville the wife doesn't think that its going to be overly complicated to learn how to use and so far she is very interested in learning how to make espresso and milk based coffees. She has been that interested that I picked up a second Dual Boiler for home. So I'm chalking that up as a success too. Finally, it only took a few minutes to set up everything thanks to the wealth of information here on the forum and only the first espresso was a throw away. The rest have been very drinkable. So that's certainly a success too. Thank you again to everyone who took the time to offer me your suggestions and thank you to Chris for putting in the extra effort to help me. I'm not sure if its coincidental or not but I'm now getting a lot more customers dropping by for a coffee and a chat and a lot more bookings from people who come by for a quote and a coffee. Barry_Duncan and TC like this.